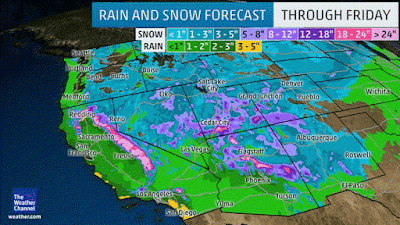 ...According to AccuWeather Meteorologist Dave Samuhel, "The storms during the second half of the week have the potential to unload 1-3 feet of snow on the mountains and ski resorts of Southern California." Through Friday, 1 to 2 feet of snow seems a good bet in much of the Sierra, with over 2 feet in the highest elevations. 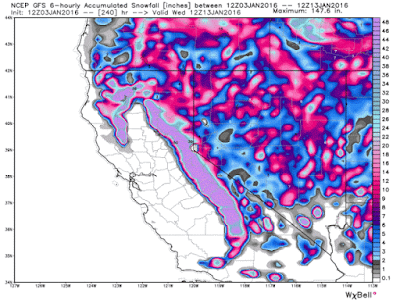 Heavy snow in excess of 6 inches is possible across some of the higher elevations of northern Arizona Mogollon Rim, the canyonlands of southern Utah, higher elevations of southern Nevada, southwest Colorado and western New Mexico. We'll have to wait and see just how much snow will fall, and where. Anthony might be correct, or he might not. 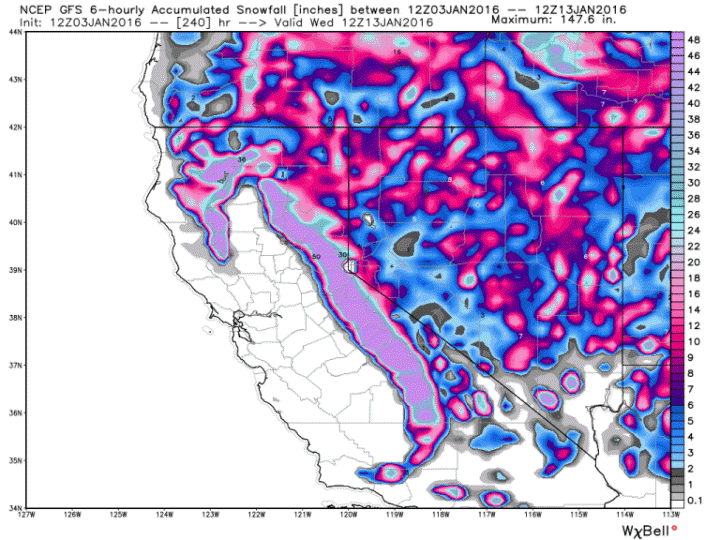 I could not find another report forecasting ten feet of snow in the Sierra Nevada. The best I could find were reports of rain over the next few days, enough to cause some minor flooding and landslides, but no deluges, and probably quite a bit of snow in the mountains. Maybe a few feet in places over coming days, but outside of WUWT (and its copy and pasters), I could find no mention of a dump of ten feet of snow. Update - see conclusion below. Anyway, I'll keep an eye on the reports of the ski resorts in the Sierra Nevada. I took the first snapshot about 15 hours after Anthony's article first appeared. Note the time of the last update alongside each resort's report. I'll add further reports over the week as they appear. 6 Jan 2016 01:57:38 UTC - there is snow reported at quite a few resorts in the last 24 hours (seven had a zero report). The highest in 24 hours was at Badger Park, with 12". The highest 72 hours was Mammoth Mountain with 15". 7 Jan 2016 00:49:43 UTC - more snow has fallen at most resorts over the last 24 hours. For example, at "upper" Mammoth Mountain, the base is now 10 inches deeper than it was in the first entry above. 7 Jan 2016 12:38:33 UTC - now it's showing no snow in the past 24 hours. It might just need updating, don't know. The most in the past 72 hours was 30" at Badger Pass. 8 Jan 2016 02:47:00 UTC - It's been snowing again. The biggest fall in the last 24 hours was 23" at Ski China Peak (39" in 72 hours), where the upper base has increased by 18" from 52" to 70". The highest in 72 hours was Badger Pass at 48" (four feet), which is also the base depth on it's upper slopes. Mammoth Mountain is now recording a base depth in the upper slopes of 115", and increase of 30" from the first day. 8 Jan 2016 18:32:33 UTC - nothing to speak of in the past 24 hours, except for Badger Pass (24") and it also has the most again in the past 72 hours, now five feet of snow (60"). 12 Jan 2016 06:49:33 UTC - hardly anything reported for the past 72 hours. Biggest snowfall in the USA: Incidentally, the most snow in a single storm in the USA is reported as falling in 1959 in the the old Mount Shasta Ski Bowl in northern California, where a total of 15.75 feet (189 inches) of snow was measured from February 13-19. Will it be enough to break the drought? The Sierra snow-pack has already been reported as above normal (at 136 percent of normal) in the most recent snow survey conducted by the California Department of Water Resources. More telling than a survey at a single location, however, are DWR’s electronic readings today from 99 stations scattered throughout the Sierra Nevada. Measurements indicate the water content of the northern Sierra snowpack is 11 inches, 108 percent of the multi-decade average for the date. The central and southern Sierra readings were 12.1 inches (116 percent of average) and 7 inches (86 percent) respectively. Statewide, the snowpack held 10.2 inches of water equivalent, or 105 percent of the December 30 average. Despite snowpack readings that are higher than last year, the major water reservoirs are storing far less water this year than their late-December historical averages. Lake Oroville in Butte County, the State Water Project’s (SWP) principal reservoir, now holds 1 million acre feet (MAF), 29 percent of its 3.5 million acre-foot capacity and 47 percent of its historical average on December 30. One year ago today, Oroville’s numbers were 1.3 MAF, which was 62 percent of its December 30 average. The state decides whether a drought has officially ended based on factors that would ensure California can weather the hot spring, summer and fall months, when little rain falls in much of the state. Thomas said at least one of three things would need to happen for the drought to be over: statewide reservoir storage would need to be at 90 percent of average levels; runoff forecasts for the state’s water year, which runs from October to September, would need to be 110 percent of average; or reservoirs on the four major rivers in the Sacramento River basin would have to reach flood control stage. 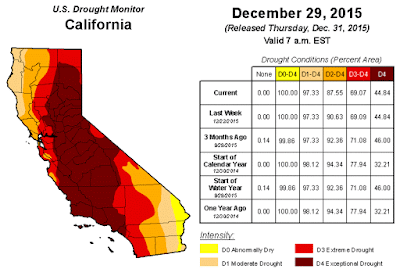 “Any of those things gives us a pretty good signal that we can say, optimistically, that we’re nearing the end of the drought and perhaps have,” Thomas said. The 1986–1994 decline of precipitation was similar to the current one that started in 2011. In terms of accumulated deficits of precipitation, that episode was no less severe than the current one. However this recent episode was more severe in another respect, having doubled occurrence of very weak precipitation compared to the 1986-1994 period. While El Niño is frequently cited as the natural forcing expected to bring a relief from drought, our assessment is that ENSO has been driving at best only 6% of precipitation variability in California in the past three decades. Starting in 1986, the climate in California shifted to a pattern of persistent deficits that gradually deepened to levels not seen in the past 35 years (Figure 3). In the winter of 1994–1995 the precipitation started to rebound, with a particularly strong recovery in the winter of the strong 1997–1998 El Niño. The current decline of precipitation, an episode that Figure 3 implies started in 2011, shows up as very similar to the 1986–1994 episode. Technically, to eliminate the previous 2 year (2012–2014) deficit by the end of the 2014–2015 rain season (that is, August 2015), TRMM estimates that California should receive the expected for the season and the accumulated deficit to a total of 847 mm. The available MERRA data for 2014–2015 rain season, however, showed that the onset of this season was similar to the 2012–2013, Figure 4. The precipitation initially picked up well in November, to only level in subsequent months. Our late estimates (not shown), using less accurate real-time TRMM and GEOS-5 forecast, reveal that California received only about 330 mm, from August 2014 to the end of June 2015, adding another 150–180 mm to the deficit. This means that the state is currently missing at least 1 year amounts of precipitation. We assess the deficit for the 2014–2015 season at 170 mm/m2 and thus the deficits from all three seasons, August 2012–2015, add up to 1 year of expected precipitation. Even though 2012 is frequently cited as the beginning of the episode, TRMM and MERRA data show the decline of precipitation actually started in 2011. Thus, we are confident California is currently missing at least one full season of precipitation. A number of research groups conclude that the frequency of the blocking atmospheric patterns driving these episodes has increased since the preindustrial age [Herring et al., 2014]. Anthropogenic attributions left aside, every next dry episode is still very likely to be felt more strongly. Assuming perfect climate, precipitation amounts in California are finite and constrained at about 500 mm/m2/yr, whereas the population and land use are growing and thus are likely to exert more significant stresses on water resources demands than climate warming [Hanak and Lund, 2008]. TRMM data, being at finer spatial resolution, assess the risks of losing the most intensive 5% of storms to have been at almost 90% for the 2011 episode. ...MERRA data imply that the loss of the most intensive 5% of storms has been more likely in the current episode. The dramatic difference in the current episode is the doubled occurrence of very weak precipitation (the weakest 5%) as compared to the typical periods. In these terms, the current episode is more severe than the 1986–1994 decline of precipitation. Savtchenko, A. K., G. Huffman, and B. Vollmer (2015), Assessment of precipitation anomalies in California using TRMM and MERRA data, J. Geophys. Res. Atmos., 120, 8206–8215, doi:10.1002/2015JD023573. California 'rain debt' equal to average full year of precipitation - press release at Science Daily about the above paper. Measuring Snow And Amusing Your Neighbors - an article by Bruce Mason on how snow depth is measured, in Teton Valley News. Small fix...The newspaper article quoted is the Sacramento Bee, not the San Francisco Bee. it's already started raining here in the Bay Area and forecast is for a wet wet commute tomorrow morning. Could it be that Watts reads HotWhopper, and is feeling the pressure of his avoidance of the climatic changes in his corner of the world? Yes of course Watts reads HW as does every online professional denier. To be clear, Watts is apparently quoting a 10 day forecast and 10 feet of snow over that sort of period in the mountains isn't unheard of. This story was posted yesterday on Roy Spencer's blog which also has a strong tendency to highlight only those weather events that presumably run counter to the "warmist narrative". Anthony breaks the rule about the world being full of "glass half empty" / "glass half full" people. He's more a "don't mention the glass unless we can pretend it's full" sort of guy. I noticed it was a rare mention of the drought, possibly because Watts thinks it may be ending and is therefore safe to mention. The comments seem to be full of the predictable it's not really an exceptional drought and/or the drought has nothing to do with climate change and/or California should dam everything to hell with smelt and salmon. You can get lots and lots of snow very quickly in the Sierras. I've been up in the Tahoe region when we got about 3 feet overnight during the 97-98 El Nino. FWIW, I was listening to KQED (a San Francisco radio station) this morning and they were mumbling something about up to 15 inches of rain in the Bay Area over the next couple of weeks, so 10 feet of snow up high would not surprise me. In March of '98 at the mid mountain snow stake at Alpine Meadows there were 240" of snow on the ground. Yep, 20 FEET! Skiing was good until the 4th of July that year! google 'california snow water content graph' to get the stats on water content in the mountain snow. Should take a big jump this week. And a small correction, Mountain High is near Big Bear in the San Bernardino Mountains, not in the Sierras. Sierra Nevada ski resorts. There might be other resorts listed there that are actually elsewhere - I wouldn't know. Where's the explanation for the weather modification / geo-engineering? Did the weather gods finally decide on some mercy for California? Have the withheld their evil machinations for a while? Why would they do that, since there is a 'global conspiracy' amongst government and scientist to 'manipulate the weather' and bring about a massive drought and kill millions of people. Most large California reservoirs are quite a bit below the level from the same period last year with around anywhere from 20 to 80% of average storage for this time of year. The rainfall has been really scattered as well, with a low of 9% of normal (1 Oct - 4 Jan) in Palm Springs to a high of 139% in Fresno. 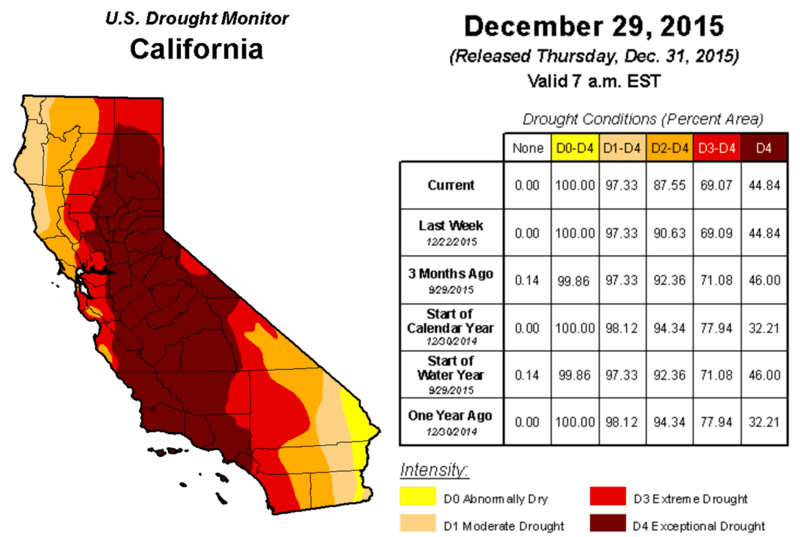 These rains may bring up the averages in southern California, but they have a long way to go to bust the drought. Hey, be fair to Tony. 2 feet falls in the 'up to 10 feet' range. So does 2 inches. If he'd just said 'up to 10 feet or more', he'd be totally immune to disproof. Might need to go to one more significant figure, though. Seems to me, going by the ski resort reports, Anthony got it wrong (again). See the conclusion above.